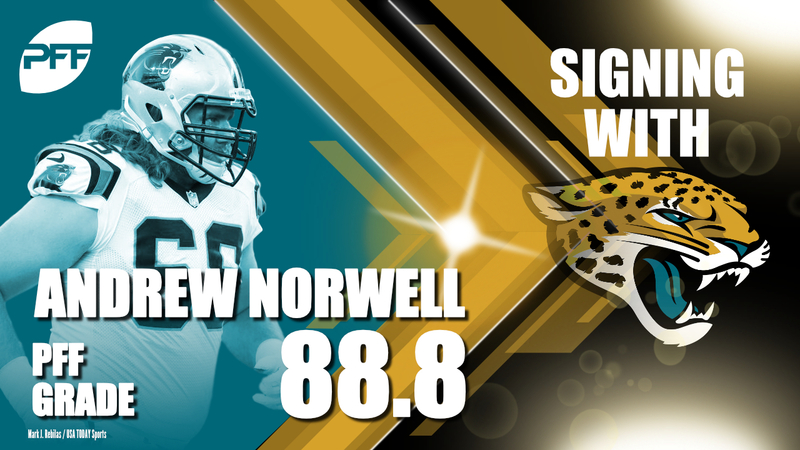 Andrew Norwell represents a laudable move from the Jacksonville Jaguars‘ front office, who could have easily fallen into the trap of buying the hype surrounding their offensive line last season, but instead recognized a weakness and addressed it in a major way. The Jaguars had a lot of positive press surrounding their offensive line thanks largely to leading the league in rushing yards, as well as dominating a good Pittsburgh Steelers defensive front in the playoffs. In reality, that was an outlier from their season, and the rushing production was far more a product of volume of carries than it was excellent blocking. The Jaguars rushed the ball 527 times in the regular season, 26 times more than any other team and 167 times more than the last team in the league in rushing attempts (Miami). Leonard Fournette and Chris Ivory as a pair combined for 380 carries, and neither player averaged four yards per carry, despite both averaging 2.5 yards per carry after first contact. Their offensive line was far from a strength and the front office deserves significant credit for their realistic self-evaluation, and then for securing their main target to address the problem. The team upgraded with one of the marquee free agents in the entire class, and the prized offensive lineman on the market. The most obvious impact Norwell will have on this team is actually the passing game, where he becomes a plug to significantly reduce pressure coming from one of the guard spots. The Jaguars guards combined to surrender 55 total pressures over the season, but Norwell didn’t surrender a sack or a hit all year. Including the playoffs, he surrendered just 15 hurries all season and his PFF pass-blocking grade of 90.9 was the highest in the league. By contrast, the highest-ranked Jaguars guard had a grade of just 63.9 (A.J. Cann). Norwell’s 2017 was by far the best pass-blocking effort of his career, but he has been consistently above average in that regard in his time in the NFL, and the worst-case scenario here sees the Jaguars significantly better at one guard spot. Either way, he should help them boost a unit that had a pass-blocking efficiency score of 79.9, good enough for 11th in the league. The other area Norwell should make an impact is the run game, which has actually been his stronger suit for the majority of his career. Jacksonville’s most prevalent offensive line combination last season – LT Cam Robinson, LG Patrick Omameh, C Brandon Linder, RG A.J. Cann, RT, Jeremy Parnell – generated an average of just 1.2 yards per carry before first contact, and for all of the carries they had, sprung the Jaguars’ backs for just 10 explosive plays (gains of 15 or more yards). Norwell wasn’t quite as dominant as he had been in years past in the run game, but he was almost as flawless when it comes to losing blocks. He had just 42 negative blocks in the run game all season, representing just 8.7 percent of his run blocks, which was good enough for second-best among qualifying guards. Norwell comes to a team whose rushing attack is a little less diverse than that of the Panthers – at least in 2017. Both teams ran more zone run concepts than anything else, but the Jaguars ran either inside or outside zone on 63 percent of their attempts, while Carolina were at just 42 percent. Perhaps his greatest strength is being able to execute blocks in space on the move – i.e. the perfect traits for a zone blocking guard. He is able to target any type of defender, and not just locate his block, but actually make meaningful contact under control and generate positive movement at the point of impact like few other guards out there. 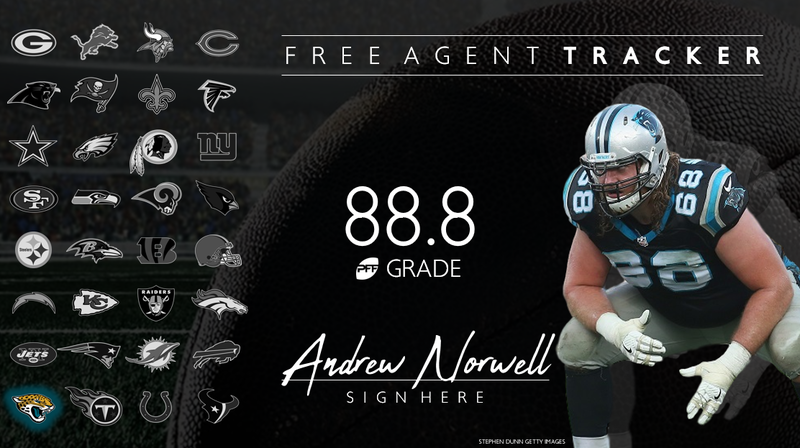 Love Andrew Norwell on the move. His ability to locate and deliver blocks in space is excellent, and important in Jacksonville’s zone blocking scheme. His ability to take on not just defensive linemen, but linebackers and even defensive backs in space and on screen blocks will be a big boost for the Jaguars’ attack, and is part of what made him not only a PFF All-Pro in 2017, but one of the best free agents on the market, even if he was one of the less heralded names.